In Vol 28, No. 164, on page 6 of Woodsmith magazine is the article which describes the Adjustable Panels Cauls. It was sent in by George Johnson of Canton Oklahoma. They give the dimensions and I followed them somewhat closely. I visited my local Home Depot to buy the goodies I would need to make my cauls. I purchased (4) seven feet long, 1×2, in hard maple. I like hard maple. I also purchased (4) 36 inches long ½ x 3 inch pieces of Oak. I only needed one piece of the oak, but I wanted the other pieces for another project. So only buy 1 if you don’t want extra, and to be honest, I didn’t use the entire one piece either, I only used 18 inches. As for the hardware, I came very close to making a tightening handle blunder, when I nearly bought a handle with the male threaded rod attached. This would have been a mistake. 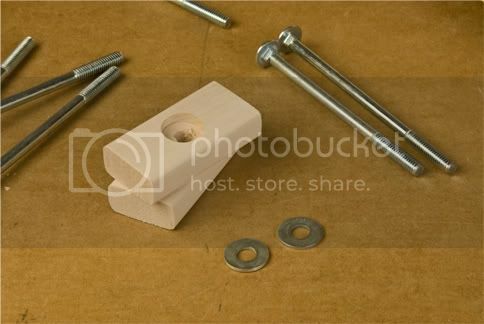 The handles need to be female which allow the threaded part of the 5/16th carriage bolt to pass through. Which brings me to the quantities of stuff I needed, the plans required 4 handles, 4 washers (I bought 8 to allow for losing a few), (24) #8, 1 ¾ “flat head screws (I bought a box). I also bought a box of 1 1/4” flat head screw, because I didn’t believe the instructions. The 1 ¾ looked way too long. They were not too long and actually worked wonderfully. Being new to woodworking, I lack confidence, so I bought extra stuff, which I didn’t need. 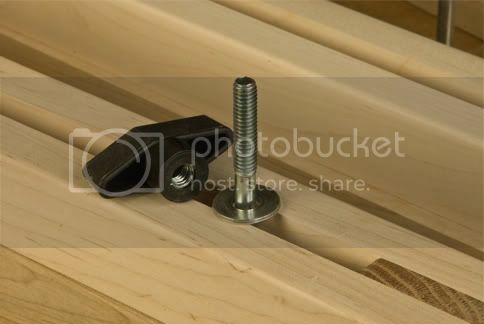 I then reinforced my fears when I purchased (3) 5” 5/16” carriage bolts and (1) 5 ½” carriage bolt. I blindly trusted the little bin that told me I was buying 5 inch, and it was very sneaky in giving me a 5 ½ bolt. I fixed the problem by buying (3) 5 ½” and (1) 5” the next day. So I have an extra set that will allow for thicker boards to be in my glue up. In the photos I used the 5 ½ inch bolt. I may buy some longer ones too. The reason one can’t just buy really long bolts is that the threads don’t go all the way down the bolt. If I had bought a 7 inch, I wouldn’t have been able to tighten them all the way down. So here is how I built my cauls. I cut (8) 36” pieces of hard maple, using my Japanese hand saw. I was amazed at how quickly it cut through each piece, and how beautiful the cuts turned out. It was definitely the right tool for the job. I like sanding. I have read that many woodworkers don’t like sanding their projects. It is considered drudgery. 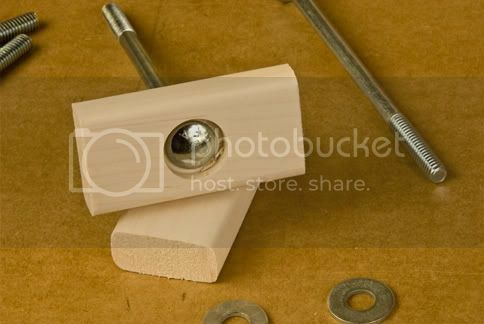 I took 2 pieces and clamped them into my vice and sanded the top to a nice rounded edge on the outside edges on the top side of the two pieces. My reasoning was, it was a waste of time to sand the inside edges, so I didn’t. I also didn’t sand the bottom edges, because I wanted them to remain flat. So I sanded up each pair. I used 80, 120, 220 grit paper and my mouse sander. The next step was to cut off 1 ½“blocks from the piece of oak. My Japanese hand saw handled this task as well. The blocks are used as spacers between the pieces of hard maple. There are 3 spacers per caul piece (top and bottom) and created the gap that allows the carriage bolts to be threaded up through the top and bottom. 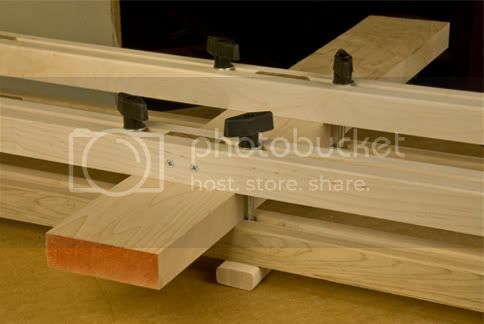 It means that one is able to move the clamping handles in to the edges of the wood when clamping, to apply the most pressure onto the wood being glued up. So with 12 pieces of oak cut, I stacked them together and sanded the tops, rounding the edges. This was done for aesthetics. Once all of this was done, I just needed to cut some blocks to hold the carriage bolts. The instructions called for 3 ½ inch blocks, but I had a lovely piece of hard maple that was 12 inches long, so I went with 3 inches for each block. Yes it was a daring move, but I am not afraid to live life on the edge. I sanded the 12 inch block before I made the cuts. I also drilled the holes, first with a Fostner bit, then with a regular bit. This meant that after I cut them into their 3 inch lengths, they were ready to go. The last step was to check the flatness of the bottoms of each caul section. I had focused on making sure that the tops were flat, because I intended to flatten any that needed it, using my router. There was only one that needed flattening, so I used my 2 inch flush trim bit. It is a really nice bit, made by Amana. I spent $128.00 on this bit. That seems like a lot, but I have already used it a bunch of times. And it cuts like a hot knife through brie. When I finally assembled the cauls, they looked even better than I had hoped. Now I just need to find a project that requires a glue up. great tutorial , brian . to having your own hardware store too ! and focused work habits . something that will pay dividends all along the journey ! Great narrative and pictures, with only one major error—to a woodworker, there is no such thing as buying “extra” wood, no matter how much you purchase! LOL…Good to know Kacy. Thanks for the tip. Very nice cauls Brian. Thanks for the breakdown. Your attention to the small details show and your shop projects do have a beauty to them. Adding to my favorites to come back to. A few years ago, there was a book published entitled Don’t Sweat the Small Stuff. After dealing with a number of system meltdowns because someone overlooked some small detail or another, I used to fantasize about the ways I would torture the author if I could ever get a hold of him. The sanding, the careful saw work, and the attention to those tiny details will make you an excellent craftsman. That is a great idea Gpops! Great looking cauls. So good that they beg another project. A nice wax paper dispenser to keep near by. Surely we don’t want to get glue squeeze out on our cauls, so we will put wax paper on the glue up to protect them. Oluf, that is an excellent point about the wax paper. Thanks! Hey Brian A project a really good thing. a unique project that should be great for use in the future. The kerf on the Japanese hand saw is very thin, so yes, each one is slightly less than 3 inches. The piece was almost exactly 12 inches, and was from the left over. To do the routing, I layed all 4 pairs of caul tops and bottoms on their side, with the one that needed trimming in the front. I then clamped the 4 sets together. Then I clamped this group to my workbench. This gave me plenty of room to set my router on, so it was stable. I intended to take about 1/32 of an inch off of one of the pieces of maple making up the caul bottom. The router flush trim bit’s bearing rested on the piece that was the guide, and then the bit evened the two pieces up. Because of the clamps the final 3 inches needed to be flattened with my 3” belt sander. A a very good tutorial blog Brian. I haven’t seen that style of cauls before, but I do think they are a very good idea and I’m sure you’ll get a lot of use out of them. As a new woodworker I know you are concerned with following plans and dimensions carefully right now, and that is not a bad thing, but in time you will realize that it is the concepts that are important and being flexible with dimensions will often allow you to make things with the materials you have on hand instead of feeling you must go out to buy the exact hardware and/or wood needed according to the plan. Thanks for the reference on the cauls, Brian. These look pretty good. I haven’t been real pleased with mine so I may have to try these. And you put together a well documented tutorial.